Ta dah! It's finally time for the big reveal – so here it is – the wedding quilt! I'm so glad to have finished this one you wouldn't believe. 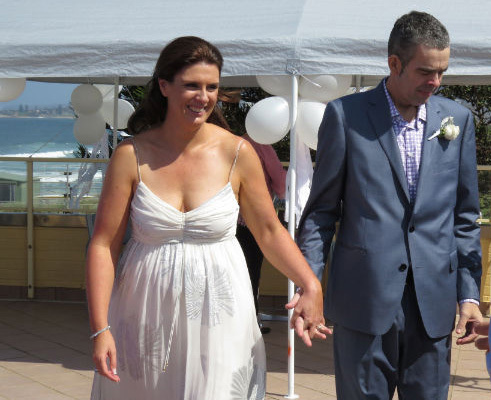 I sewed the last stitch on the binding half an hour before the ceremony started – eek! I'm really very happy with how it turned out though, and thankfully so were the recipients! There were so many little hiccups at the end of this quilt. I just assumed I'd be able to find the right blue for the borders locally, and then when I couldn't, and had to order it from OS, I missed my window with my usual quilter. It was then I decided to quilt it myself. I'm still not sure if that was a great idea, it's very far from perfect and I'd never quilted a quilt this size before. I can't say I'm rushing to do another one! For those who haven't heard the story, Jude is a long-time friend of mine, who, after watching me make various quilts for soon-to-be-wed family members asked me "how do I manage to get one of these?" Always on the lookout for a new project, I said I'd start collecting fabrics for her for various birthdays and Christmases and then make it over the next few of years. 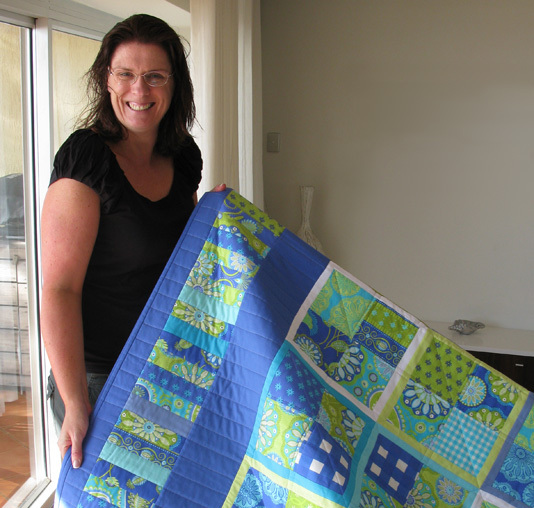 Not long after that, Jude finally met Mr Right, so with a wedding in sight I decided it was high time I finished the quilt. The wedding weekend itself was lovely. Some other friends and I rented a house right along the beach from the wedding. It was stunning and so nice to to have made a weekend of it. 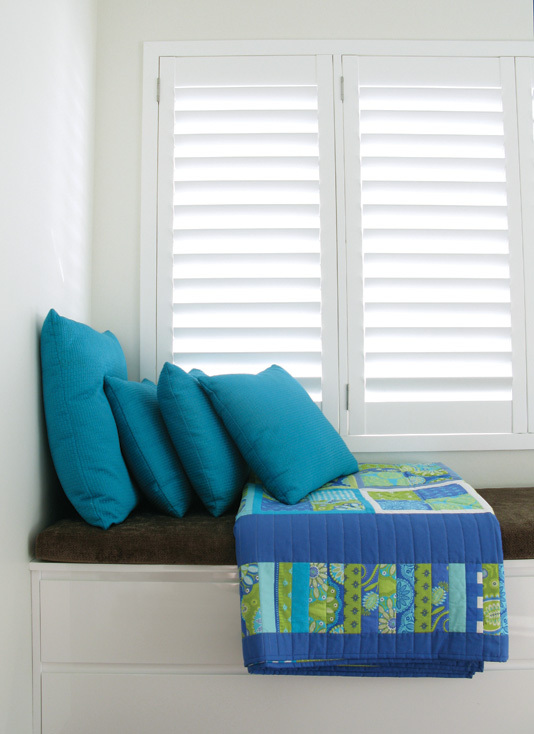 The quilt pictures above are taken in the house and it was just the perfect setting to show it off don't you think? As you can see, the weather was wonderful, the bride looked lovely and the day went off without a hitch. So last, but not least, here's a pic of the bride after she's just unwrapped the quilt. Smiles all round – happy, happy, joy, joy! Wow that is so pretty! Great job!! This is just gorgeous!!!! Amazing!!!!! You did an excellent job! The quilt looks spectacular. I think you did a mighty fine job on the quilting. The colors and pattern work so well together. Great Job! Oh my. It is GORGEOUS! And you did a great job quilting it! That looks amazing. I love those colors. I'm glad the recipients loved it. Thanks everyone! I got text from the bride the other day with a pic of it on their bed saying how much she loved it. 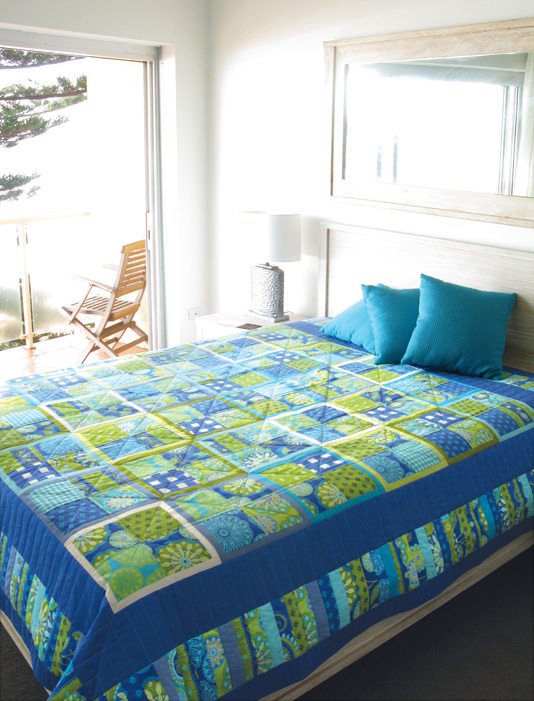 The quilt is so gorgeous... it just makes me think of a beautiful beach afternoon by just looking at it! Thanks LethargicLass - I did always find it really soothing looking at the colours each morning when it was laid out on the floor. Gorgeous wedding gift that will be such a treasure for them! The fabric colours are amazing! Love your quilt. Looks to me like you did a great job of the quilting! Thanks @desertskyquilts – though you'll notice there's no close-up shots of the quilting ;-) Looks like you're getting through a lot of projects on your blog!